Being healthy doesn't only mean you're at a healthy weight, it also means you have a healthy body composition without too much body fat. Having a body that's too high in body fat can put you at an increased risk for disease, including diabetes and heart disease, even if you're at a healthy weight. Before you can calculate your percentage of body fat loss, you need to know your original body fat percentage and you'll need to have lost enough weight to potentially affect your body fat percentage. Typically, the calculations are estimates, because the more accurate ways to measure body fat aren't usually available to the average person, and they can be very expensive. Lean body mass usually ranges between 60 and 90 percent of your body weight, with men and younger people typically having a higher percentage of lean body mass than women or older people. Using an online, lean body mass calculator can give you an idea of the average amount of lean body mass, and thus body fat, for a person of your gender, weight, height and age. An average woman has 25 to 31 percent body fat, while an average man has 18 to 24 percent body fat. Athletes and very fit people have lower body fat percentages. Men need at least 2 to 5 percent body fat to be healthy, and women need at least 10 to 13 percent body fat. Two methods of estimating body fat are sometimes available through gyms, personal trainers and health clubs: skinfold calipers and bioelectrical impedance analysis. The accuracy of skinfold caliper estimations will depend on the skill of the person doing the measuring. A nutrition or fitness professional uses calipers to pinch skin and fat at different points of your body and plugs these measurements into an equation that estimates body fat. This method isn't as accurate for people who are overweight. Bioelectrical impedance involves using a device to send an electrical signal through your body that estimates body fat percentage, based on how long it takes the signal to pass through your body, as the signal takes varying amounts of time to travel through different tissue types. This method can be inaccurate in people who are overweight or underweight or in people who are dehydrated or overhydrated. The more accurate methods usually done only in medical settings include underwater weighing, the BodPod, near-infrared interactance and dual-energy x-ray absorptiometry, or DEXA. Desired body weight = lean body weight / desired lean mass percentage in decimal form. 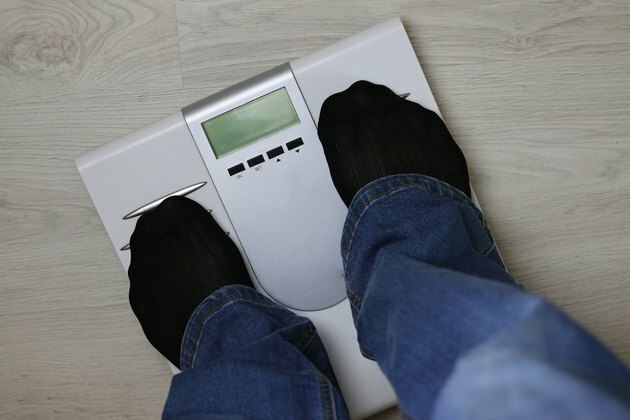 This means if your current body fat percentage is 30 percent and you weigh 160 pounds, you multiply 160 times 0.3 to figure out how much of your body weight is fat -- in this case, 48 pounds. This means your lean body weight is 160 minus 48, or 112 pounds. If you want to decrease your body fat percentage to 25 percent, you subtract 0.25 from 1 to get 0.75 -- your desired lean mass percentage in decimal form. In this case, 112 divided by 0.75 calculates to a desired body weight of 149 pounds. Since your starting weight is 160 pounds and your desired body weight for your target body fat percentage is 149 pounds, you'll need to lose 11 pounds of fat to reach your goal. If you lose weight solely through diet and don't do any strength training workouts, about 25 percent of whatever you lose is most likely from muscle, not body fat, which means you'd need to lose even more weight to lower your body fat percentage. The more exercise you do and the greater its intensity level, the greater the effects are likely to be on your body composition and weight loss, according to a study published in 2004 in Archives of Internal Medicine. One of the good things about losing weight through exercise -- and not solely by diet -- is that the loss is more likely to come from abdominal fat, according to a study published in 2003 in Medicine and Science in Sports and Exercise. Abdominal fat, also called visceral fat, is a particularly unhealthy type of fat that can increase your risk for diabetes and heart disease. For weight loss, get at least 300 minutes of moderate-intensity cardio and two strength-training workouts per week. Focus mainly on the larger muscle groups and do about 10 repetitions of approximately 10 different exercises per strength-training workout. You'll want to work your chest, abdominals, arms, shoulders, legs and back. For example, you can do squats with or without holding weights to work your lower body, push-ups to work your upper body and crunches to work your abdominals. Most people understand that to lose weight you need to cut calories, but not everyone understands which dietary changes may be most effective. You need to have a deficit of 500 calories each day to lose 1 pound per week. You can reduce calories through diet by cutting down or eliminating sweets, fatty foods and highly processed foods. Protein is particularly beneficial in a weight-loss diet. For example, a study published in 2005 in The Journal of Nutrition noted that a diet higher in protein helped increase the beneficial effects of exercise on body composition during weight loss. Both protein and the fiber found in fruits and vegetables help make your meals more filling, making it easier to cut calories. American Council on Exercise: What Are the Guidelines for Percentage of Body Fat Loss?